Sawcutting involves the formation of joints or breaks in a PCC mass (slab) by the use of mechanical cutting tools. Sawed joints are formed using hard-tipped rotary saws, which can use either diamond or other types of abrasive blades (Figure 1). Most joint sawing is done using industrial diamonds as the primary abrasion element. Diamond tipped blades will generate high amounts of heat when cutting and generally must be cooled by water to prevent the saw blade metal from overheating and melting. 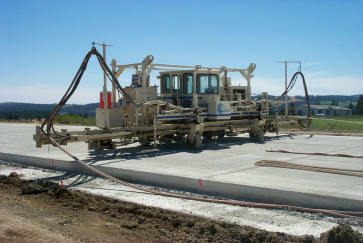 Water also prevents dust formation during sawing. Dry sawing uses abrasive blades that are usually made from fiber reinforced silicone carbide or carborundum since these types of blades do not require water for cooling (ACPA, 1995). These abrasive blades have less cutting ability than diamond blades and are usually used on PCC with softer aggregate (ACPA, 1995). When cutting, these blades will wear down over time making it important to periodically check the sawed depth and saw blade diameter to ensure adequate joint depth (ACPA, 1995). Additionally, unless water is used to prevent it, these types of blades will generate sawing dust. Small saws. 6 – 13 kW in power and most commonly used for dry sawing applications. 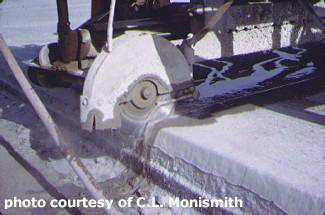 Lightweight saws (see Figure 2) used for early sawcuts are categorized as small saws. Medium saws (Figure 2). 15 – 28 kW in power and most commonly used for wet sawing applications. Large saws. 50 – 55 kW in power and most commonly used for wet sawing applications. These saws are often used for longitudinal joints where their lack of maneuverability due to size is not critical. Span saws (Figure 3). 50 – 150 kW in power and are most commonly used for wet sawing applications. These are usually multi-bladed and used in high production jobs. Sawing window. This prevents permanent slab damage due to uncontrolled shrinkage cracking, loading an inadequately set slab, or spalling the cut joint of an inadequately set slab. Proper joint location. Contraction joints must be cut over the internal dowel bar locations. If these locations are not marked, joints may not be cut at the dowel midpoints, which can result in excessive slab and dowel bar stresses. Joint cleaning. Joint cutting will result in a fair amount of debris generation. After sawing, this debris should be washed out to prevent it from contributing to faulting or joint stresses. Before sealing joints should be abrasively cleaned to provide a good textured surface with which the joint sealant can bond. 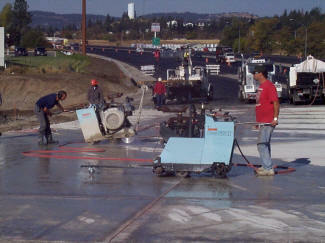 Finally, the residue from the abrasive cleaning should be blown out to provide a clean bonding surface.